In the wake of anti-Semitic comments from Rep. Ilhan Omar (D., Minn.) and several closed-door conferences by Democrats to discuss related issues within the party, Rep. Andy Levin (D., Mich.), a former synagogue president, organized a meeting as "a more formal event that would focus on anti-Semitism." The March 5 meeting of Muslim and Jewish lawmakers was a "moment meant to be about listening and learning" about the "raw experiences" of the elected officials, according to the Post. During the meeting, some Democratic members "admitted they didn’t know what anti-Semitism looks like," according to the Post. To help manage the conversation, which was previously unreported, Levin invited Bend the Arc, a left-wing organization deeply critical of Israel and Republicans. In a recent tweet, the group called for Americans to "reject the Islamophobic policies our government is built on." When a Bend the Arc organizer in the room made a joke "about Jews and money," Rep. Jahana Hayes (D., Conn.) questioned why the facilitator could talk like that when someone like Hayes could not. She later told the Post no one should be making comments of the sort. "It’s not okay," Hayes said when asked about the specific exchange. "These [sorts of jokes] are off-limits. It’s confusing for someone like me who is trying to learn." It took nearly two hours before a Democrat brought up the repeated anti-Semitism of Omar, the impetus for the entire conversation. The congresswoman, a member of the Progressive Caucus, has drawn scrutiny and condemnation since taking office in January for a series of anti-Semitic remarks. Rep. Dean Phillips (D., Minn.), a Jew who represents a district neighboring Omar's, told the room he considered her comments to be "tips of the arrow" of Jew hatred in America. According to "several participants" who spoke to the Post on the condition of anonymity, Phillips asked Omar to apologize and "publicly affirm Israel’s right to exist and protect itself." Phillips's request that Omar support the right of Jews to exist in the Jewish state and in the United States "stunned the three Muslim Democrats in the room." Omar did not reply to the Jewish member's request. Instead, one of her allies responded by changing the subject to the Palestinians. Tlaib "grew emotional and started to cry as she spoke of her grandmother’s suffering in the West Bank at the hands of Israelis," according to the Post. Tlaib has faced scrutiny for ties to anti-Semitism and for anti-Semitic comments of her own. In January, she accused senators supporting pro-Israel policies of acting as if they "represent" a country other than the United States. Maher Abdel-qader, one of Tlaib's top campaign volunteers and fundraisers, promotes anti-Semitic conspiracies. After Tlaib spoke at the March meeting, Phillips embraced her and expressed interest in meeting her grandmother, who lives in the West Bank. Some members, rather than respecting Phillips's concern for the American Jewish community, made it about race. They "saw racial undertones in Phillips’s comments, offended that a wealthy white businessman representing an affluent suburban community was suggesting a black refugee such as Omar incited fear." Omar spurred backlash after a February event in Washington, D.C. where she gladly took on past accusations of anti-Semitism, and in the process, made fresh anti-Semitic comments. "I want to talk about the political influence in this country that says it is okay for people to push for allegiance to a foreign country," she said. Soon after, she doubled down on the comments and did not apologize. Omar's recurring anti-Semitism provoked condemnation from members of both parties, and it resulted in a watered-down resolution condemning hate in all forms. In addition to Omar's most recent controversy, she made a series of ill-advised tweets in early February concerning Jewish Americans, the state of Israel, and the United States government. The freshman congresswoman peddled in anti-Semitic stereotypes, mischaracterized a pro-Israel lobbying group, and garnered praise from the former grand wizard of the Ku Klux Klan. Tlaib defended Omar then, too. 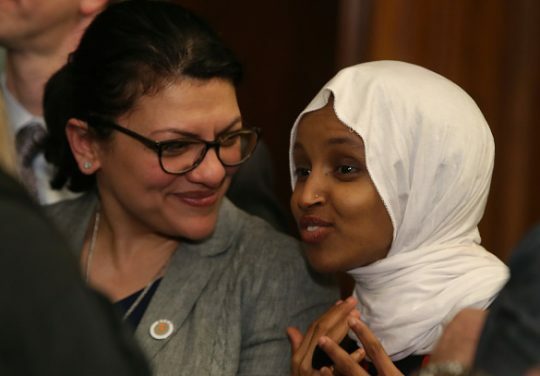 She claimed calls for Omar to leave the House Foreign Affairs Committee were a form of "Islamophobia," not a proper response to anti-Semitism. Likewise, Rep. Pramila Jayapal (D., Wash.) defended Omar, claiming the outrage, much of it voiced by American Jews, was really a scheme "designed to prevent us from taking on the question of our foreign policy toward Israel." Both Tlaib and Omar declined to comment to the Post about the meeting. This entry was posted in Politics and tagged Anti-Semitism, Democratic Party, Ilhan Omar. Bookmark the permalink.